Erin McKean, the founder of Wordnik.com, a word navigation system that helps people unlock the value of words and phrases to discover what information is most meaningful and matters to them, has been enamored with the English language since her childhood. She was the editor in chief of the New Oxford American Dictionary, 2e, and is the author of Weird and Wonderful Words, More Weird and Wonderful Words, Totally Weird and Wonderful Words, and That's Amore, and her first novel, The Secret Lives of Dresses, was just published a few months ago. The Fashion Spot: Can you trace your fascination with words/the English language back to anything specific? Erin McKean: Yes! When I was eight I read an article in the Wall Street Journal about the second edition of the OED. I couldn't believe that making big lists of words was a real job! tFS: What are your favorite "fashion words"? Why? EM: I love the word "directional," which means something like "trendsetting." You can tell if something is "directional" if it looks completely wackaloon at first, but then six months later everyone in your 10:30 meeting is wearing it. I also love the "fashion singular", e.g. "They're showing a great pastel stingray-leather shoe for spring" or "This designer has a way with a pant that other designers can only envy." tFS: Most overused words by fashion industry folks? EM: It's not that particular words are overused, it's that superlatives in general are devalued. If everything is amazing, superb, fantastic, gorgeous, fabulous, delightful, etc. etc., how do you express your actual delight and amazement? 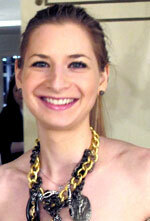 tFS: "Arm party" is a big fashion word of the moment. Any thoughts? EM: I love it! I think it really reflects the joyous nature of fashion. Why do we wear an armful of bracelets? Because they make us happy. tFS: How have bloggers affected fashion jargon? What are the odds that words/phrases like "arm party" ever become "legitimate" and make it into a dictionary? EM: The etymologies of fashion words are usually pretty straightforward — for instance, "frock" was used to refer to the clothing of monks before it was used for women's clothing; a lot of other fashion jargon is borrowed from French (long considered to be the center of the fashion world). Chic is more interesting, as it may be related to an older word meaning "trickery" (related to "chicanery"). The original French sense was closer to something like "style" in the non-clothes sense, more like "artistry" or "excellence". The word "couture" is changing; it used to be strictly applied to the made-to-measure clothes of the top Parisian designers, but now it is more generally used to mean high fashion in general.